LED Tables bring extra style and surprise to your event. The tables are powered by a battery pack which will last between 10-15 hours which means it will last from your wedding breakfast and right up until the end of the night. Having a battery pack ensures that there are no trailing wires from table to table keeping the room looking very neat. The LED’s are controlled by a handheld remote control which work in sync with the LED Starlight Dance Floors and can even be switched on when you step onto the dance floor for your first dance!! 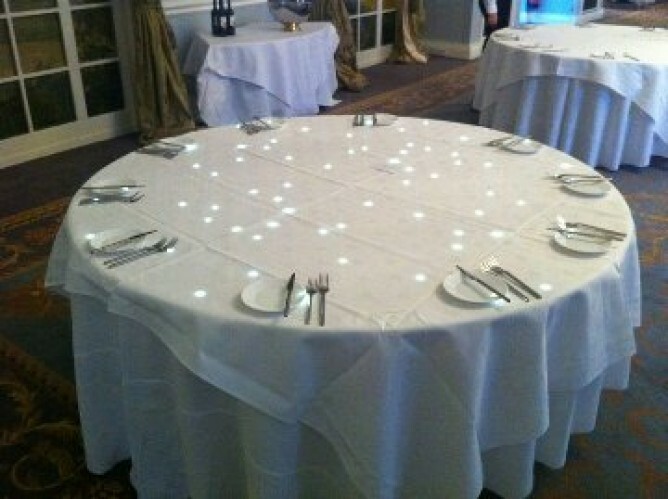 The built in LED’s are powerful enoough to shine through the table cloths and has even been known to shine though a plate! Have a question about the LED Tables? LED Tables can be supplied alongside our White LED Starlight Dance Floor throughout the UK including Derby, Burton on Trent, Stoke on Trent, Nottingham, Leicester, Manchester, Liverpool, Chetser, Preston, Blackpool, Carlisle, Newcastle upon Tyne, Durham, Middlesborough, Leeds, Bradford, Wakefield, Glasgow, Edinburgh, Scotland, Inverness, Kettering, Northanmpton, Milton Keynes, Coventry, Rugby, Luton, Hemel Hempstead, Welwyn, Hammersmith, Totenham, Wembley, Kent, Essex, Brighton, Portsmouth, Bournemouth, Swansea.